Living in Miami meant that one was exposed to more than just Latin cuisine. 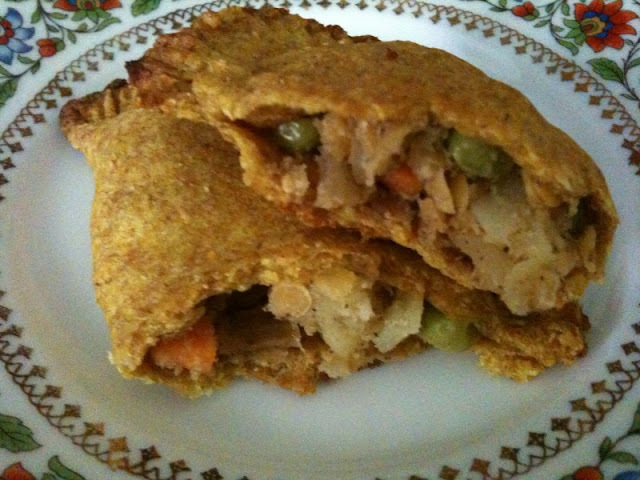 My mom and I would go to the Caribbean Market off US1 south to buy golden Jamaican patties - they were filled with a spicy mixture of potatoes, carrots and peas, and we would enjoy them with tea. 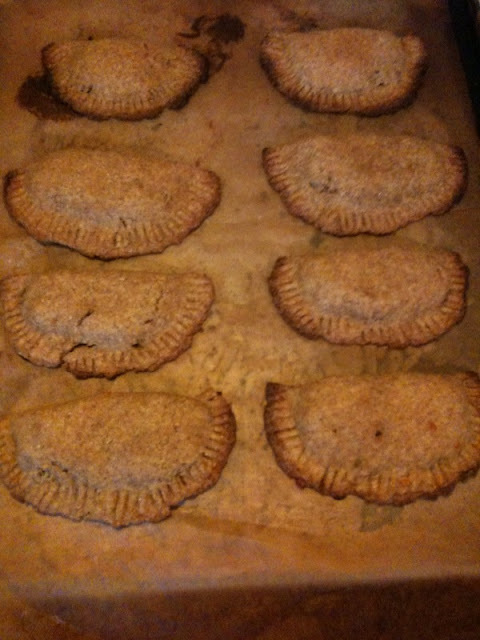 I think Jamaican patties can be that just perfect snack between lunch and dinner, with a cup of tea or coffee. I added some protein in the form of red lentils because I'm bored of the regular vegetables that it traditionally involves. During the week I feel I need to stock up, in case hunger hits. This is the perfect thing to freeze and then warm in the microwave because it has a hearty tender crust. It is not a traditional Jamaican patty -- this crust is completely whole grain, and the seasonings are straight from my every day pantry. But it works. May I say it tastes great with homemade ketchup. 1. In a large bowl, add the flours, salt, turmeric, vinegar and massage in the oil until crumbly. Add water and knead enough to bind into a smooth dough. Let rest while making the filling. 2. In a pan, heat olive oil and add onion, carrots, chili, cumin, coriander, cinnamon and cook until tender. Stir in peas, boiled lentils, mashed potatoes salt and pepper. 3. Preheat oven to 400F/200C. 4. Divide dough into 8 golf balls. Roll each ball into a circle, 1/8 inch thin. Add a tablespoon or so of filling in the middle, then fold in half, seal the edges and press with a fork to further enforce the seal. 5. Arrange the patties on a parchment-lined baking sheet. Bake 10-15 minutes until golden around the edges. Cool and store in an air-tight container in the fridge or freezer.